Thick boneless pork chops are browned and then baked with sliced apples, cinnamon, and brown sugar. This dish is fabulous with rice or potatoes and a salad. 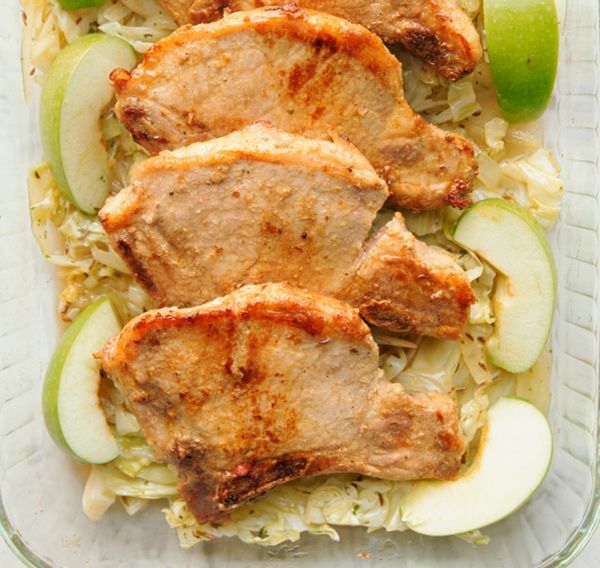 It's a very easy recipe to fix any night of the week, and the apples and cinnamon add flavor and texture to the chops. Serve this tasty dish with hot cooked rice or potatoes for a fabulous everyday meal. Arrange the apple slices in a buttered 13x9 inch baking dish. Sprinkle with the cinnamon and brown sugar. Melt the butter in a skillet over medium heat. Sprinkle the pork chops with salt and pepper, then brown on both sides in the butter. Transfer the pork chops to the prepared baking dish, arranging over the apples. Add the apple juice, brandy, or wine to the hot pan; swirl and scrape up any browned bits. Pour over the chops. Cover the baking dish tightly with foil and bake for 35 to 45 minutes, or until pork chops register at least 145 F—the minimum safe temperature for pork—on an instant-read thermometer inserted into the thickest part of a pork chop. Serves 4.